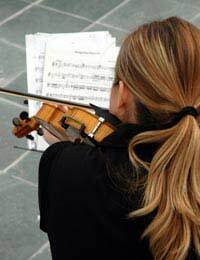 After you gain some competence and confidence on your instrument, you might want to spread your wings and try other styles of music instead of the classical you've probably been learning. Now you feel good enough to join in a bit, you can look outside your studies, and use the knowledge you gain to improve as a player. But how do you go about it? The great thing about folk music is that it's inclusive, rather than exclusive. One of its best features is the "session," where musicians gather in a pub with their instruments to play tunes. As long as your instrument is portable (a piano would be a problem, for instance) you'll be welcome. Don't worry if you don't know the tunes. Pick them up by watching others and joining in quietly. The atmosphere is as much social as about music. Go two or three times and you'll find yourself making friends and joining in. So how do you find a session? If there's a local folk magazine or web page, consult that. Ask someone in a folk club. Many cities have several over the course of a month, and no one will make fun of you if you don't play well. Soon you'll be playing tunes with the best of them. About the only way you're likely to make rock music is by joining a band; there's not quite the same tradition of sitting around and jamming as there is in folk. But if you're young, the chances are you'll have some friends who play, which can open up endless possibilities. Of course, a lot depends on your instrument (there's not much call for tuba in rock, for instance), but rock has an excitement you won't find elsewhere. If you want to start a band, you can try advertising in a music shop, or in a local free paper that deals with entertainment. You might not find what you need, but you'll get to play with others, and develop an idea of what you really want. Jazz musicians love to play with others in jams, as well as in bands. However, they have nothing like the session; it's usually just musicians playing together after a gig, and getting involved in that is a lot harder. You might also find it a little intimidating unless you're an experienced player, as the jams tend to involve different musicians taking solos over specific songs from the jazz repertoire, and they're usually all advanced players. Since classical music doesn't involve improvisation, you'll need to read music fluently before you become involved in this. There are ensembles to encourage amateur musicians of different levels, but it will still demand a certain level of skill. There's plenty to be learned from exposing yourself to different kinds of music. You not only learn how others approach things, but also the way the music is composed, which can be very different from what you've learned. The thing to remember is that everything you do increases your musical knowledge - you can pick up little tricks from watching (although your teacher might not approve of them all). There's the joy of discovery of different music, the way it all links together, and the fact that you'll learn quickly, too.